1. Heat oil in a deep fryer to 375 degrees F (190 degrees C). The oil should be just enough to cover wings entirely, an inch or so deep. Combine the butter, hot sauce, pepper and garlic powder in a small saucepan over low heat. Stir together and heat until butter is melted and mixture is well blended. Remove from heat and reserve for serving. 2. In a small bowl mix together the flour, paprika, cayenne pepper and salt. Place chicken wings in a large nonporous glass dish or bowl and sprinkle flour mixture over them until they are evenly coated. Cover dish or bowl and refrigerate for 60 to 90 minutes. 3. Fry coated wings in hot oil for 10 to 15 minutes, or until parts of wings begin to turn brown. Remove from heat, place wings in serving bowl, add hot sauce mixture and stir together. Serve. Hi, I came across your blog through Mommys Kitchen. 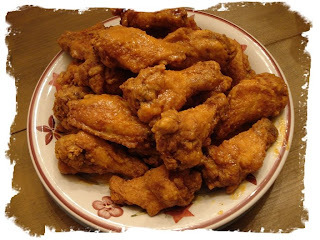 These wings look great and I have really enjoyed reading all your recipes. I have read your profile and I think your me!! LOL. But I'm in Texas. I also have three girls, mine are 21, 19 and 16. Okay NOW I HAVE got to try these when we move and I have room to make them YUMMY!!! Can I come over for soem wings?? Silly questions - but I don't like wings, so do you think it would be okay to use boneless breasts and instead of deep frying stove top? I can't eat deep fried and spicy, what do you think?